A beloved D.C. music legend has passed away at the age of 75, Johns Hopkins Hospital confirmed Wednesday afternoon. Godfather of Go-Go Chuck Brown had been hospitalized for several weeks. His daughter Cherita Whiting told NBC Washington he died from complications from pneumonia. “We thank all the fans for their prayers and love and concern,” Whiting said. Brown had postponed a performance at the new Howard Theatre in late April due to illness, although no reason was given at the time for the hospitalization. Earlier this month, rumors of Brown's death circulated on Twitter. His manager asserted those rumors were false, and his daughter K.K. Brown confirmed that Brown was still hospitalized at that time. The Brown family would like to thank everyone for their love and support over the years. We know that Chuck's legacy will live on through all of you who have supported him and his creation of Go-Go. His passion, inspiration and drive have always come from his family and fans. He would have wanted all of his fans to know that they meant the world to him and none of his success was possible without them. God bless. A bandleader, singer and guitarist, Brown was one of the rare go-go artists to gain national attention. Leading the Soul Searchers in the 1970s, Brown was fundamental in the creation of the go-go sound, which he described as percussion-driven, jazz-infused funk with African and Latin elements and his signature call-and-response, which involved the audience in each performance. "We do a song, break it down," he said. "We get into the audience; they get into us. And it just goes and goes and goes. Come out of that particular tune and go into another groove, but it's all basically the same groove." Brown had said he was striving to find his own unique sound before it became the sound of the city. He said he fused the various elements of his sound in 1966, first putting the sound on record in 1972 with "We the People." He credited the fans for helping create the performance style. "We would do quite a few songs in one night," he said. "We might do 15, 20, 25 songs in one night. Back in those days we were doing Top 40 -- anything that came off the radio that was a hit, we got into it. We decided to break it down and start the call-and-response with the fans. They really made it happen for us. They started that 'wind me up, Chuck' thing -- that's when I was doing Bootsy Collins 'Wind Me Up,' I was doing his version and was also doing a lot of James Brown -- so the audience really started that 'wind me up.'" He hit No. 1 on the R&B charts with "Bustin' Loose" in 1978 and had another hit with "We Need Some Money (Bout Money)" in 1984. Brown received his first Grammy nomination in 2010 for Best R&B Performance by a Duo or Group With Vocals for "Love," featuring Jill Scott and Marcus Miller, from the album "We Got This." Brown's career began in the early 1960s, playing for bands like Los Latinos. In and out of trouble with police in his youth, he had taught himself how to play guitar in prison. Throughout his life he remained a frequent performer at city events and spent a lot of time with D.C. schoolchildren. 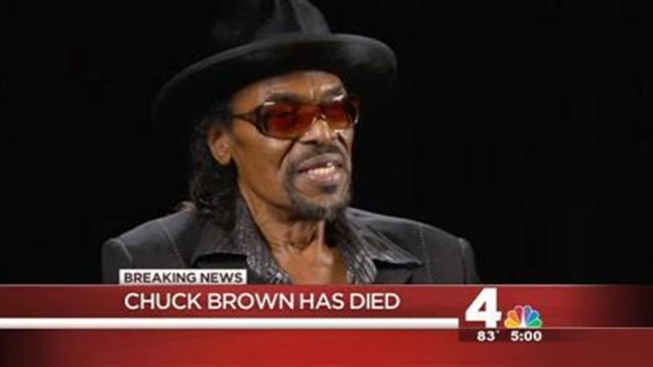 “Chuck Brown was the best kind of performer," D.C. Councilwoman Mary Cheh said, "one who will be remembered not only for the quality of his work, but also for his contributions to the community."